How many times a day does a song play in your mind? We teach kids the alphabet with a song. We recall the best times we had in school with music. No matter what memories you recollect as you move through life, chances are there’s a tune that goes along with it. Music is an important part of our lives. From age 1 to 100, life wouldn’t be the same without music. It provides entertainment and helps us get through the toughest time of our lives. We face it all a little easier knowing a familiar tune shows us the way. But what happens when you create music instead of just listen to it? Studies show it impacts you in many ways. When you create music, your creativity increases. Creating music gives you a chance to express your creative side. No matter if you’re performing a popular piece of music, or have authored your own, your personality can shine through. Have a budding musician in your household? Want to let your kids be more creative, build more self-confidence, and give them a can-do attitude? Why not let them play the piano? PreviousPrevious post:What Piano Brands Should You Consider?NextNext post:Do Pianos Really Increase In Value? Should You Use An iPad For Your Piano Music? 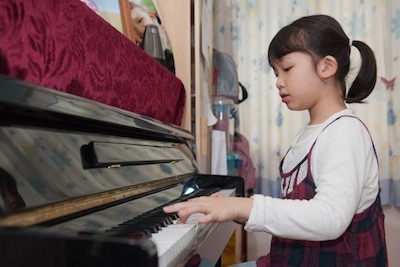 Piano or Sports, Which Is Better For Your Kids? Coltharp Piano World represents the finest pianos in Memphis, Tennessee, the Midsouth and the world. In addition to quality sales and service we offer moving services, restoration services and piano tuning. We offer new the best new, used and vintage pianos anywhere. And our prices simply cannot be beat. Come and see our newly remodeled showroom and our beautiful new event space. We welcome your call.